Graphite is also a chemically inert substance and has an extreme temperature resistance. Because of these unique properties, graphite outperforms almost every other material, including steel and titanium, in plate applications that require very high temperatures. Graphite plates are commonly used for structural ribs, components of kilns and copper, zinc and aluminum extrusion machines, cable manufacturing, carbide, electrodes, plastic injection molding parts, lubricating and sealing plates, and the most widely used—bipolar fuel cell construction. They can also be used to dam molten metal in metal fabrication plants and provide a protective barrier in welding processes. The aerospace, paper, chemical, cement, electronic and electric industries also use graphite plates for many different application functions. Natural graphite is composed of layers of graphite which are not tightly bonded to each other and therefore can be separated easily. 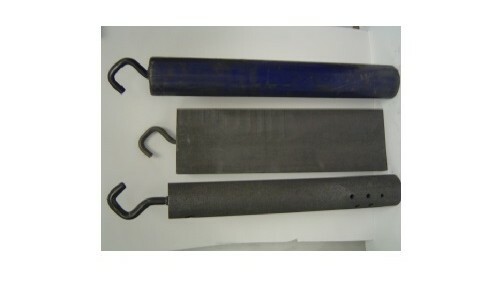 Some thinner flexible graphite plates are used as sealing material. The graphite plates are custom made and also come in many different standard shapes and sizes, although plates are always uniformly flat, generally have 90º angled corners and are thinner than graphite sheets, which are very flexible and are able to be rolled up. The extrusion process involves pure graphite, carbon graphite or a mixture of materials being heated until flexible and then forced through a hollow profile. Most plates are made of multiple uni-directional layers that have been sandwiched together with an epoxy. Because graphite tends to be a porous material, many plates are impregnated with wax, resin or high purity linseed oil to create a gas-tight seal and eliminate the problems that pores and impurities create. Many different grades of graphite are used to make plates. IPG is made of fine particles, exhibits high strength and sharp detail. PL-850 is dense and oxidation resistant, meaning it fares will in extremely high temperatures. PL-800 is easy to machine and is also used in high temperature applications like furnaces and kilns. Pure graphite is used in fuel cells and as graphite electrodes because it has lower density than other temperature resistant metal plates. However, it tends to be quite brittle and polymer binders are added to give the graphite more flexibility. The plates may be smooth, textured, have exterior layers made of high gloss woven carbon fabric, corrugated, engraved or have a patterned design. Like most graphite products, plates are inexpensive and simple to manufacture. Graphite Plates Graphite plates are typically smooth, flat and have uniform thickness. Manufactured through the process of extrusion, they are electrically and thermally conductive and therefore are used in many industrial applications.